Let ABC be any triangle you draw. From each vertex, draw two lines outside the triangle, each one at 30' (red arcs) with the sides that meet each other in the vertex. 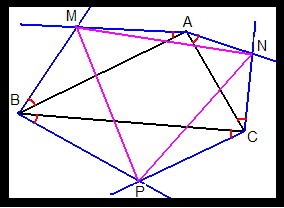 These 6 lines cross, two by two, at 3 points, named M, N, and P.
Prove that, no matter what triangle ABC you draw initially, the triangle MNP is always equilateral. where Z_30 = 1/2 + i*sqrt(3)/6. where Z_60 = 1/2 + i*sqrt(3)/2. Therefore, MNP is an equilateral triangle.